The hand includes a variety of muscles, bones and ligaments that contribute to its dexterity and ability to movement. The three major types of bones in the hand include the carpal bones of the wrist, the phalanges in the fingers and the metacarpal bones in the center of the hand. Several ligaments, muscles and sheaths are found within the hand itself. 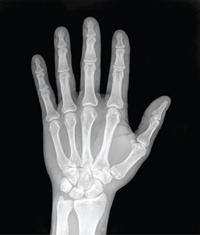 There are several root causes that can damage to any one of these structures, causing pain in the left hand to appear. Arthritis or inflammation of the joints may occur throughout the wrist or hand. This pain can stem from the ligaments, tendons or synovial membrane. Osteoarthritis, a degenerative form of this condition is more common in older patients. This disease progresses slowly, primarily affecting large weight-bearing joints and the hands. This condition can be caused by injuries, genetics, fatigue or muscle strain. You may note heberden nodes on the affected joints. These are small enlargements of the bones or cartilage. Treatment: there is no cure for arthritis, but anti-inflammatory medication is often used to help manage the pain. Carpal tunnel syndrome is caused when the median nerve which passes through the carpal tunnel into the wrist becomes compressed. This nerve is responsible for providing motor function and sensory information to the three middle fingers and thumb. This may cause a burning or tingling in the fingers, a pins and needles feeling in the fingers, pain or numbness in the hand, and difficulty making a fist or gripping objects. Treatment: because these symptoms are similar to those caused by rheumatoid arthritis, tendonitis or bursitis your physician should be consulted for a proper diagnosis. Carpal tunnel syndrome can be treated by splinting the hand to minimized compression of nerves within the carpal tunnel, injected or oral anti-inflammatory medications to reduce swelling, changing the position of your keyboard or other items that cause you to compress the wrists or surgery to relieve compression on the nerves. Ganglion cysts are typically benign soft-tissue tumors. These may appear on the back or front of the hand. Symptoms may include the appearance of a firm, smooth, round, tender cyst, localized swelling, mild aching in the wrist that slowly grows over time or wrist pain that becomes increasingly aggravated with repeated use. Symptoms will vary amongst patients. Treatment: cysts that are small and do not cause any pain do not typically require treatment. Should the cyst begin to interfere with the functionality of the hand a physician should be consulted for a proper diagnosis and treatment. Treatment typically includes splinting, aspiration, rest, cortisone injections, taking nonsteroidal anti-inflammatory medication or surgery. Tendon problems in the hand often refer to tenosynovitis or tendonitis. Tenosynovitis is a condition which causes the lining of the tendon sheaths to become inflamed, inclosing the tendons and leading them to become inflamed as well. The cause of this illness is largely unknown but it is believed that overuse, strain, excessive exercise or injury of the hand may play a role in its formation. Conditions such as arthritis may also cause this condition to form. Tendonitis is caused when a tendon itself becomes inflamed. This may cause damage to any tendon but it will most frequently occur in the fingers or wrists. Tendon problems lead to discomfort, pain, swelling or irritation in the affected area. Treatment: tendon problems will be treated by addressing the swelling in the area. Non-steroidal anti-inflammatory medications or steroid injections may be applied to reduce the swelling. Ice, immobilization of the area or activity modification can help ensure that the swelling does not return. In more severe cases surgery may be necessary to repair the damaged tendon. Fractures can refer to simple fractures where the bone is broken but still aligned and stable, complex fractures where the bone has become displaced, compound fractures where the bone has broken through the skin or comminuted fractures where the bone has broken in multiple places. Fractured fingers can cause stiffness, loss of movement or swelling. You may note that the fingers appear shorter or swollen as well. Treatment: treatment of a fractured finger will vary based on the nature of the injury. In most cases a split will be used to immobilize the damaged area so the bones can heal. If the break is very complex plates, pins or wires may be used to hold the bones in place. These devices will be inserted surgically. Surgery may also be used to realign the bones properly. Trigger finger is a common name for stenosing tenosynovitis, a condition that causes the thumb or fingers to become locked in a bent position. When the patient attempts to straighten the affected digit it can be quite painful. Trigger finger is caused when the flexor tendons in a finger become agitated, causing the tendon sheath surrounding them to thicken. Nodules may also begin to form on the tendon, making it difficult to move the digit smoothly and eventually causing the finger to become stuck in a certain position. As this condition takes hold you may notice that the finger appears to “catch” when it is moved into certain positions. Treatment: trigger finger is most commonly seen in women or those between the ages of 40 and 60. Conditions such as gout, diabetes and rheumatoid arthritis can also contribute to the development of trigger finger. Over the counter medications can be used to address the pain caused by this condition. Resting the affected digit or wearing a splint may also cause the tendons to relax. If the stiffness will not fade on its own it may be necessary to apply corticosteroid injections or surgery to restore the hand to normal. Dupuytren’s contracture is a contracture of the tissue that causes thickening of the hand, palm and fingers beneath the skin. While the cause of this condition is unknown it is noted that a family history of the condition appears to play a role in its formation. It is more common in those past the age of 40, men and those suffering from diabetes, alcoholism or tobacco use. Trauma does not appear to play a role in the formation of Duputren’s contracture. Symptoms of this condition may appear on both hands, most often near the ring finger. The symptoms will then spread down toward the small finger, middle then index fingers. Painless, small nodules may appear below the skin on the palm that thickens into cord-like bands over time. It may become difficult to straighten or extend the affected fingers, which may render them immobile in severe cases. Treatment: a physical examination by a doctor is often sufficient to diagnose Duputren’s contracture. Should this condition appear, patients will be encouraged to take warm baths, exercise the area or splint the fingers based on the nature of the affected tissue. In some cases surgery may be necessary to restore movement to the fingers. This will be followed by rounds of physical therapy. Some doctors are now using rounds of collagenase injections to help reduce the scarring caused by Duputren’s contracture, reducing the healing time by almost 10 years. However, these injections also cause itching, swelling and pain so it is important to discuss the risks with your doctor before agreeing to such treatment. Pregnancy may cause redness, tingling, numbness, swelling or pain in the left hand which will fade once the baby has been delivered. Those that frequently work with their hands may notice that their hand cramps after a long period of use. Repetitive motion syndrome, caused by moving the hand in a similar fashion for a long period of time, can also cause the left hand to experience pain. Severe cases of diabetes may cause the hands to lose their ability to feel or touch as the blood flow to the digits becomes restricted. If the pain in the hand is accompanied by a crushing pain or tightness in the chest along with overwhelming fatigue and shortness of breath it may be caused by an oncoming heart attack. The hand contains many different ligaments, muscles and bones which contribute to its dexterity and movement. Because the hand is so complex a variety of conditions can contribute to pain in this area. If you are experiencing repetitive pain or it is accompanied by more serious symptoms, contact medical assistance as soon as possible while mild soreness in the hands can often be managed with home remedies. Massaging the affected area of the hand using gentle, circular motions for several minutes can help relax the tendons and ease stiffness to bring about relief. Regular massages can also reduce palm or finger spasms that are caused by soreness in the hand. Some find placing a cold compress on the inner wrist can help reduce inflammation. Others prefer to place a hot pack on the arm, wrist or hand to release tension in these areas. Alternating between these two methods of treatment is ideal for addressing conditions such as carpal tunnel syndrome. Soaking the hands in a mixture of warm water and essential oils for 15-20 minutes can relieve pain. You should soak sore hands at least once a week but this can be performed up to 3-4 times a day as necessary. Applying a soothing hand cream after the hands have been soaked will provide additional relief. Warming the hands, particularly at night, can reduce stiffness and swelling. Apply a hand cream to ensure the skin on the hands will remain moist and wear thick gloves when it is cold to trap your body heat and ease soreness in the digits. Ergonomic equipment refers to gel wrist supports that can be placed in front of areas such as the computer. These allow you to keep your hands and wrists in a more comfortable position to avoid damaging these areas. Hand braces can often be purchased from your local pharmacy. These devices are designed to keep the wrist in a healthy position so that they will not become aggravated when you are performing repetitive tasks such as typing. Some also find that wearing a brace when hand pain occurs helps it to fade more quickly. Resting the hand can help relieve discomfort from overuse or conditions such as carpal tunnel syndrome while stretching a sore hand can help relieve spasms. Fanning the fingers and gently bending them at the joint so they point toward the palm, turn the wrist clockwise then counterclockwise or open and close the hand repetitively to release excess tension in these areas.